The Shot Caller is a gritty memoir reminiscent of the international bestseller The Cross and the Switchblade. At just sixteen, Casey was sentenced to more than twelve years in solitary confinement in California's toughest prison as one of the state's most violent offenders. He thought his life was over. A visceral insider's look at the violent world of gangs and prison life, The Shot Caller is a remarkable demonstration of God's reckless, unending grace and His desire to reach even the worst of sinners-no matter where they are. 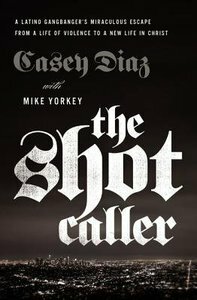 About "The Shot Caller: A Latino Gangbanger's Miraculous Escape From a Life of Violence to a New Life in Christ"
Casey Diaz came to this country when he was two years old, the oldest son of El Salvadorian immigrants who settled in the barrios near downtown Los Angeles in the 1970s. An abusive father who constantly beat up his mother propelled Casey into street gangs at the age of 11. He rose quickly within the ranks of the Rockwood Street Locos and participated in home invasions, car jackings, and stabbings of rivals, often with a screwdriver or knife. At 16 he was arrested and sentenced to nearly thirteen years in a state prison for second-degree murder and 52 counts of robbery. After two years Casey was shipped to New Folsom State Prison and placed in solitary confinement for 23 hours a day. When an older black woman committed to prison ministry approaches his cell and tells him Jesus loves him and God is going to use him one day, Casey scoffs at her. Then, one day a miraculous event takes place in Casey's cell. Just like a movie, his life is "projected" onto his cell wall. He sees himself as a young child in his old neighborhood and then his early days in the gang-scenes that only he could remember. Then he sees a long-haired man carrying a cross with a mob yelling at him. The man is nailed to the cross and placed between two others sentenced to die. The man on the cross looks at Casey and says, "I'm doing this for you." Casey hits the cell floor and weeps. He knows this is Almighty God speaking to him. He confesses his many sins and expresses deep remorse. When he is done, he hears God tell him to ask to see a chaplain. After hearing Casey's story, the chaplain takes out his Bible and reads the Crucifixion story and explains God's plan for salvation, which Casey accepts. The Shot Caller is both a never-to-be-forgotten insider's look at the violent world of gangs and prison life and a powerful, modern demonstration of how God will go to the most miraculous extremes to reach even the worst sinners. Today, Casey Diaz stands as a trophy of God's glorious grace. Darwin "Casey" Diaz is a native of El Salvador and a former gang leader. Growing up on the mean streets of Los Angeles, he was forced to fight for his life. He was eventually incarcerated as one of the most violent criminals in California and placed in solitary confinement. His life was forever changed in that cell when one day God approached Casey in a miraculous way. Upon his release from prison, Casey landed a job making signs and today runs his own company, Cheap Signs. Casey enjoys teaching at church and sharing his story with audiences around the country. Grateful for a second chance at life, Casey is now married to Sana and is the father of three children.